The times of thrift and fiscal prudence are long gone. In its effort to defuse social discontentment, the government spent billions of Dirhams either by subsidizing further strategic commodities, or by increasing dramatically wages in the public sector. The result of these unexpected expenses led to further borrowings, and the time might come very soon when the unfortunate government of the day will be compelled to implement austerity plan measures, to slash some -if not all- of these subsidies, or to privatize more assets to pay up for interest on this unexpected debt, all of which would have been the result of unsound economic policies no one will be ultimately responsible for. Parallel to these public spending cuts, the social cost in terms of purchasing power losses and unemployment will exacerbate further existing social tensions. “Toward the end of the 1980s, the Bank was excessively bullish it its assessments of Morocco’s economic future. Progress in public enterprise and financial sector reforms was considered excellent. […] The Bank’s overoptimism continued through 1993, despite the fact that there had been hardly any economic growth since 1990. Growth slowed from almost 5 percent a year in the second half of the 1980s to 2 percent in the early 1990s”. And though great efforts have been made in upgrading the Moroccan economic structure, a potential austerity plan applied to the economy is most likely to finish off these sectors that have not been entirely reformed, namely private investment, rural areas, health and education. Furthermore, the economic growth -our official panacea for all structural economic growth hardships- has been too low to sustain real wealth creation. The consensus around Morocco’s economic growth potential is estimated around 5-6%. The 2011 Budget estimate for nominal growth is 5% with a 2% inflation, that is about 3% real growth. A poor showing indeed, considering how other comparable emerging countries manage to score higher growth figures. An austerity plan will most likely bring us into depression, an economic outcome too gloomy to contemplate, and yet very likely if the government continues in their folly trying to buy off loyalties and peace of mind. Is the austerity plan likely in Morocco? Haven’t we managed to borrow the whooping sum of € 1 Billion a year ago? Aren’t the financial markets confident in our sound economic policies? not quite. Consider the level of public debt in Morocco: According to the Finance Ministry’s debt figures, total public debt represents 49.3% of GDP (late 2010) much less than the 80.5% level recorded two decades ago. The foreign-held public debt -our subject of interest- accounts for about half of it i.e. 22.4% of GDP, an 8% increase compared to the 2009 period, an increase in total contradiction with the decade-long average trend of a 9% annual decrease. Now, these figures are nothing like those recorded in the early 1980s (when foreign-held debt was 110.9% of GDP in 1983) and the potential danger is certainly not that of a debt crisis where the Moroccan government would be unable to honour its debt. The danger looms domestically, because of the constraint national foreign currency holdings represent, economic authorities will be obliged to halve many public spendings; and because much of the budget is about non-productive expenses, the axe will primarily fall on the subsidies. One of the reasons why Morocco’s rating is not Investment-Grade across all rating agencies is due to its weakness on foreign currency. The latest Bank Al Maghrib figures on that matter testify on our economy’s inability to field enough foreign currency to sustain economic resilience. Foreign holdings as of June 2011 are about MAD 182.8 Bn, a 6% dent compared to the MAD 194 Bn reserves held on December 2010. 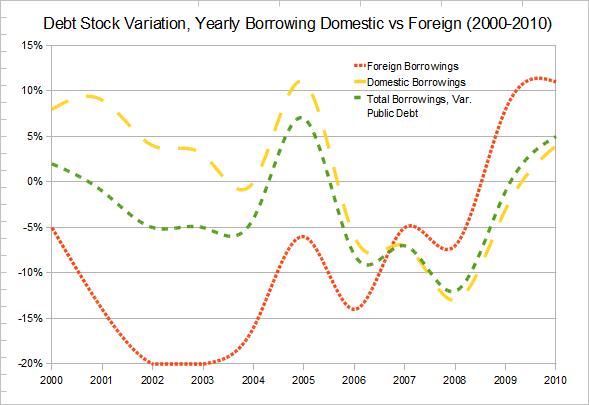 Already the effect of these policies can be felt on these reserves; the pressure on the foreign reserves can be linked to the public debt: indeed, as the graph shows, Morocco resorts more and more often to foreign debt, and so since 2005: even though domestic debt remains the preferred debt vehicle for government spendings, foreign-held debt stock have increased 33% over the last 5 years, compared to the 12% for domestic stock over the same period. This, of course, is due to the gluttonous borrowings the Finance Ministry has engaged in to pay for many expenses: the new military acquisitions, the various “Grand Design” workshops, the subsidies, etc. have taken the annual domestic public borrowings from MAD 42 Bn in 2005 to MAD 54.2 Bn in 2011 an average of 4.34% annual increase, a commensurate variation to nominal GDP growth’s, about 4.84%. On the other hand, the budget circa 2005 records an additional MAD 7 Bn of foreign borrowings, compared to the MAD 18.05 Bn in 2011, a far larger annual increase of 17.1% a year. This is evidence that government spending resorts more and more to foreign borrowing, thus building on an increasing stock of foreign debt. The debt is also getting more expensive to pay back: even though the ‘super-borrowing’ of June-September carried only a 4.57% coupon interest, the overall foreign debt paid since 2007 has steadily gone up with an increasing interest/principal ratio, while the economy does not grow fast enough to create enough exports and attract foreign investments, in order to match the required payments. The debt problem has also another feature, perhaps more concerning: the short-term debt (exclusively domestic) increases at inflationary proportions. The same Finance Ministry figures attest to that: early 2007, overall short-term debt amounted to MAD 15.3 Bn. 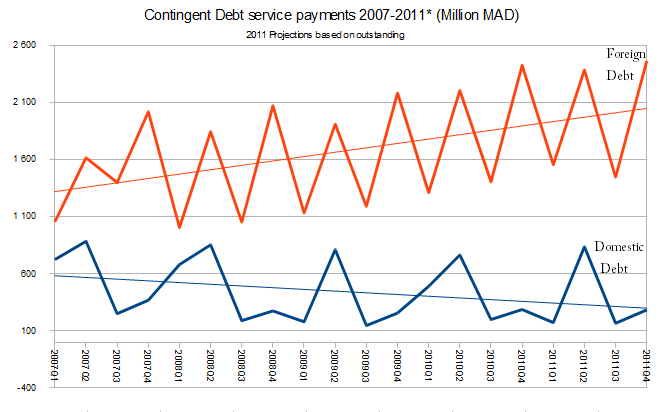 Projections for debt service mid 2011 are MAD 18.22 Bn. This is due to the fallacy of low interest paid on short-term debt: 3-months treasury bonds pay a coupon of 3.44% while 5 years bond yield 3.94%. Though it is cheaper for the government to pay for short money, it also compels it to continue to borrow short in order to meet its most urgent expenses, and these have been quite numerous these last days. Debt on itself is not such a bad thing: it can help public authorities benefit from leverage effect when important investments such as infrastructure upgrade or education and research facilities spendings are involved; They can provide value by expanding potential growth. But when subsidies equate the amount spent on public investment (about MAD 53.85 Bn for investment, about MAD 45 Bn for subsidies) the only outcome is future austerity plan and economic depression. Of course, these can be avoided, provided a deep-range fiscal reform, including an end on amnesty over agricultural taxes (who benefit to those owning more than 10,000 ha) and the tax breaks that benefit annually up to MAD 7 Bn, exclusively to the 10-20% richest individuals and households in Morocco. It feels good to be (liberal/radical) home. For those who are not familiar with the awesome Dailykos blog, NetRoot Nation is the new name of Yearlykos, the annual convention of all progressive bloggers in America. And quite frankly, the keynote address (2,500 fired-up left-wingies in the audience) was the closest thing to a regular party convention in the United States, and we FPC bloggers, have been invited to attend the conference, and even participate in some of various panels, among which I spoke on the Arab Spring and the use Youth make of new media in their pursuit of democracy. The use of new media in pro-democracy political forces. Ah… I still remember myself and a couple of friends of mine, hammering out the leadership to come up with a media strategy for the party to circumvent the handicap they are suffering from in term of media visibility. Get the internet, set up a coherent communication strategy, and for crying out loud, TAKE OUT THAT F**KING OBSOLETE WEBSITE! The best answer they could come up was: “that’s very nice of you kids, keep it up” which is codeword for “ok kids, are you lecturing us on how to communicate with the masses? you are very sweet, you armchair activists“. And truth be told, I do feel contrite about that, because as an expatriate, I cannot do much on the field, except perhaps try and convince fellow expatriate students that embracing democracy and lobbying for political awareness is a temporary patch for this hunger for action. Then comes February 20th, suddenly, even the most tech-conservative party leaders come to the conclusion that the internet is a useful tool, and straight up, a video channel has been created, a couple of (ill) produced videos uploaded there… a patchy start, but a start nonetheless. That was the substance of my intervention on the question whether bloggers and cyber-activists are “arm-chair activists” or whether they can take their issues to the field and campaign accordingly. And quite frankly, the underlying assumption of this idea, following which only a marginal fraction of Moroccans are connected is challenged by the data at hand: there is a growing number of individuals connected to the web, many of whom are connected via mobile device and getting access to mobile and high-debit connections. There is also an increasing number of young Moroccans -and now, even the seniors- who prefer to get their news from the Internet first, as well as spending increasing hours on the web look for the information they cannot find -or with which they can interact- in more traditional media outlets. The figures put forward by the ANRT body are comprehensive on that matter. In less than two years (September 2009-March 2011) the number of individual internet subscribers have more than doubled, and there are now about 2.1 Million households connected to Internet in Morocco, about 3/4 of these being mobile (i.e. 3G subscribers) Furthermore, an increasing number of internet users have been looking for high-debit connections, a indeed those with low-debit connections have decreased dramatically, and as of March 2011; only 966 subscribers kept on the classic internet connection contract. As a result, Moroccan internet users have become increasingly mobile, and consume larger packs of data, hence the quasi-total subscription to 1 Mb/s offers. Considering these numbers, the potential internet public out there can be at least of 8 Million and counting. The idea that internet is confined to a small population becomes more and more irrelevant. There was also a discussion on how the civil society, or more generally the public debate might benefit from the new/social media offer. The curse of our own civic society is that it is lively and diverse, but lacks the proper channels to publicize its deeds and attract new volunteers. Because the public media outlets are either locked-in (like the TV and Radio Stations) to those parts of civic society deemed too “politically incorrect”, and if there is no alternative channel for these organizations to express themselves and contribute to any issue of the public debate, then they would ultimately die out, and slowly, only the blandest and uninteresting would survive in an decorum media world. 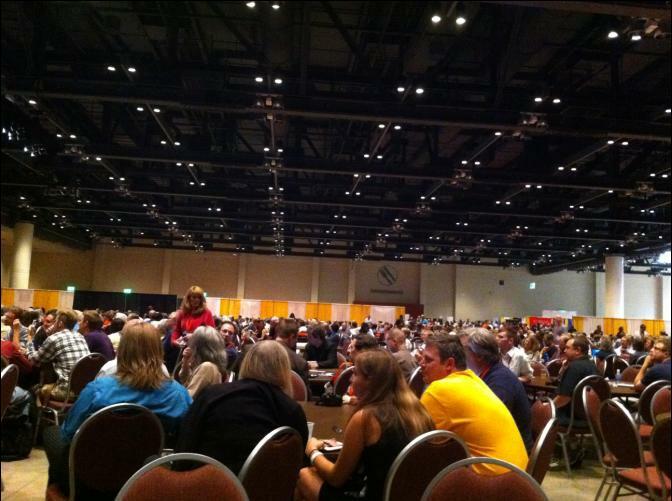 2,000 to 2,500 delegates at Netroots Nation, all progressive and left-wingers. the new media managed to spice up the public debate among those who care about the issues. We are indeed a small, tiny minority on twitter, less so on facebook, but there are definitely thousands of blogs around the Moroccan web-citizens and NGOs, many of whom are opinion leaders or likely to be so. Since regular media channels are either locked up, or engaged in politically correct soliloquies, social and new media become more attractive to those how cannot air their views and opinions. It is likely to be messy and disharmonious, but that’s a start. Last but not least, there was an incident that showed the American paradox: on our second day at Minneapolis, and prior to the Karaoke night (which I have spent with Dailykos contributor UnaSpencer, chatting about politics) a GOP (Republican) Blogger harassed two Hijab-wearing young women by filming them in an outrageous bullying manner under the guise of ‘Freedom Of Speech’. I Say Yes, You Say No. Now Shut Up. The Campaign for Referendum Day has already started, and it is more than likely the next couple of weeks are going to be ugly, with Moroccans brocading others as traitors and un-Moroccans while others are branded as Makhzenian puppets. At least we are sure of one thing: our society is deeply divided; Whatever our political -however firm they might be- there is hate for those who do not share our beliefs, and there is active hostility to those who try to voice them. Such a rift between dissidence and conservatism is wide enough for the regime not to interfere, or at least not to do so publicly; they have now their minions to do the ugly shore of suppressing and harassing dissidence, while keeping up the decorum of democratic debate. Not to mention the earlier communiqués released by our significant partners (the European Union‘s Commissioner Catherine Ashton and United States Department of State Secretary Hillary Clinton, among others) all supporting and praising our unique experience in MENA region. Yes, it is depressing for the dissidents in Morocco not to find support or forum -but the social media- to voice their opinions. Now those crossing swords on Facebook, twitter or other social networks do not represent the larger population in Morocco, whether ‘traitors‘ or ‘chlahbya‘. There is such a thing as The Silent Majority among Moroccan voters. Those who vote but do not have a good grasp on what they are voting for (or against) and those who know exactly what it’s all about, and yet do not want to get involved in the issue. And between those groups (large enough and yet difficult, if not possible to gauge because of the polling restrictions) there are those who do not care, or simply cannot make their minds up. But the thing is, those who care about politics need to engage in a dispassionate debate, otherwise, the essential exercise of democratic debate will be marred with over-excitement and these violent salvoes of criticism and verbal abuse only confirm further the prejudice many Moroccans hold on democracy: a factor of dissension and deadly fitna. So many Moroccan institutions and political organizations are calling for a positive vote on the draft constitution. I suppose it is a commendable position, as long as it is buttressed by sensible arguments, even though I tend to disagree with their judgement. But that is the nature of democracy, and the diversity of opinions does contribute to its strengthening. I wish that was true, but the pro-No and Boycott are utterly handicapped by a plethora of reasons, the first of which is the impossible task for voicing their position on public media, either because of the obscure HACA (Haute Authorité de Communication Audiovisuelle) regulations regarding political campaigning on public media outlets, or because of the illegality of publicizing a boycott. The only open spaces on which the dissidence can express itself freely remain the private newspapers -with the financial and trial hazards such venture entails and the social networks, uncensored but still messy and unpredictable as means of mobilization for advocacy and public causes. And even on those unfettered forums, violent discussions and insults flare up against those of us who dare express a different opinion. 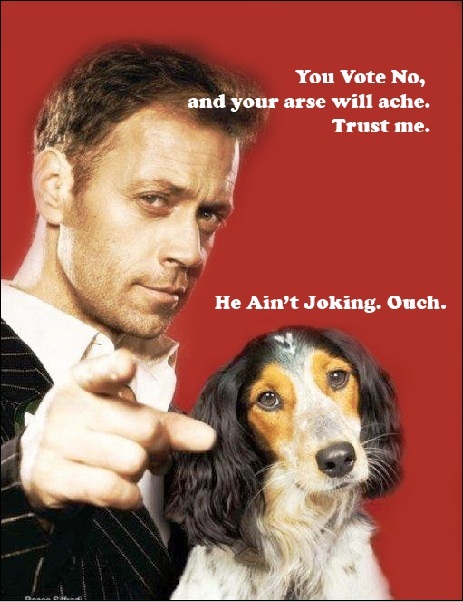 I believe the pro-Yes vote has enough support -genuine support- for the authorities not to interfere and let the ball rolling, business as usual. My theory-sustained only with subjective impression- is that the violent events that occurred yesterday -and very likely to happen in the next days and weeks- are not the signs of a nation-wide policy from the highest authorities to stifle No/Boycott dissent, but rather those of zealous local officials, ready to muster the needed support from obliging local neighbourhood NGOs, thugs and tramps to enforce the “National Consensus”. Such as it is, the wonder of Makhzenian machine is to work efficiently with no paperwork, no written directives, not even a concerted policy. And in this unique brand of authoritarianism, the regime can successfully manage to keep their hands clean, and at the same time elicit active support from mainstream political parties and local elected officials. “Do you want democracy? Here’s your neighbourhood’s favourite tramp threatening you with a 15-inch machete“. or indeed the RNI’s rally turned ugly after individuals brought in to fill in the seats voiced their anger and started throwing plastic bottles and cans to ministers Salaheddine Mezouar and Moncef Belkhayat. The political rift also allows to glimpse at the dangerous levels of social and economic frustrations among the lower bracket of working class, whether in their anger towards local administration, or in their open hostility against middle-class protesters. Social frustration can also be observed in the kind of insults directed to Feb20 supporters: traitors, republicans, islamists, whores, atheists, homosexuals and ‘ramadan-breakfasters’ are the recurrent sobriquets bestowed upon those who happen to be motivated by the need to shake up things in a stagnating Morocco. The same rift runs along the traditional antagonism in the Moroccan public debate: Amazigh vs Arab-supremacist, Secularists vs Religious conservatives, “Traitors” vs “Patriots”. In normal times, these clashes would be confined to newspapers, blogs and social networks, but these historical times -both at home and abroad- amplify and exacerbate the tension. And though we need these opposite opinions to be voiced, it would be better to do so within a mild-mannered, democratic debate. The coming weeks however, allow to foresee but further violent debate and clashes. Constitutional speeches are like Earthquakes, and in every sense of the word: they are earth-shattering, and they often come in a pair: the wave and the counter-wave follow each other and when the magnitude is high enough, the effect on the landscape is impressive. But this earthquake is not one. As a matter of fact, it might very well turn out to be a false alert. Yesterday evening, the King gave the second speech on the Constitutional Reform, and announced Referendum Day for July 1st, just like what Khalid Hariry tweeted about on May 18th when his colleagues and himself met the Interior minister. At the same time, the speech laid out the essential features of what is essentially the new constitution, which is more than likely going to be voted by a comfortable margin. Before considering the political implications of this extraordinary short time span for political debate and campaigning, as well as the already biased rules of the campaigning game. Contrary to the constitution circa 1996, the project has been carefully drafted, with a special focus on detailed procedure, perhaps to excessive lengths. Because the past constitutions have been written -and then cosmetically arranged so as to give a façade of democratic constitution- by one man, the late king Hassan II, and by his own admission, the writing process is daunting, but in his case, he managed to produce five constitutions that fit his larger-than-life character and lust for power; The latest of these Hassan II-era constitutional pieces of legislation, the 1996 constitution, was supposed to seal the deal on political transition, the so-called “Alternance Consensuelle“. So compared to the succinct constitutions we have had since 1962, this one is a true constitutional lawyer’s piece of work. Too bad it has been written by mainstream and conservative panellists. The 180 articles in the new constitution, contrary to what has been speculated upon, do not change the monarchy from executive to symbolic, but rather recognize a de facto actual exercise of power; as we shall see later on, the monarch retains a great deal of appointment privileges, and while he did cede many of his formerly privileges, these concessions are not enough for the new constitution to qualify as that of a parliamentary monarchy. This is so because many of its articles are bluntly contradicting various universal standards of democracy, among others the separation of powers, the precedence given to and accountability required from the elected representatives of the people. None of these things have been mentioned in the new draft, and that is why I reiterate my stand on voting against the constitution on Referendum Day. المملكة المغربية دولة إسلامية ذات سيادة كاملة، متشبثة بوحدتها الوطنية والترابية، وبصيانة تلاحم مقومات هويتها الوطنية، الموحدة بانصهار كلمكوناتها، العربية – الإسلامية، والأمازيغية، والصحراوية الحسانية، والغنية بروافدها الإفريقية والأندلسية والعبرية والمتوسطية. كما أن الهوية المغربية تتميزبتبوئ الدين الإسلامي مكانة الصدارة فيها، وذلك في ظل تشبث الشعب المغربي بقيم الانفتاح والاعتدال والتسامح والحوار، والتفاهم المتبادل بين الثقافاتوالحضارات الإنسانية جمعاء. This piece of preamble, while signalling a significant shift in the official narrative, because it now recognizes the obvious, and finally admits that diversity does not harm national unity. But the encouraging opening soon fades away, and the disappointing, almost insulting order of precedence reminds all of us who credited the commission with some amount of good faith that the centre of power, with all its legitimacy, is not yet ready to abandon the Arabo-Islamic hegemony. Notice the order: Arabic, Islamic, then Amazigh, Hassani, and the Hebraic heritage is relegated to the rank of a mere “influence”. Though this might sound like a fickle, this ranking is actually important because the preamble does not explicitly put all these ‘fundamentals’ on an equal footing. And judges can justify many of their ruling by this, as it might come up. Consider the example of a citizen suing the local administration because they refused to register their infant’s Amazigh name. Suppose the case goes all the way up to the Courts. It might very well be that the Judge would sustain the administration’s decision by invoking the order of precedence in these fundamentals. And considering how conservative the Judges’ corps are, this instance is more than likely to be observed in the near future. The New Royal Motto: "Monarchy Rules All, and That's Official Now"
The positive contribution in the preamble is the unequivocal support and endorsement of international treaties on Human Rights and International Law. This was one of the most important pledge activists wanted the government and the regime to honour, without restrictions or reservations. This does not mean the end of police brutality, or the abuses citizens have to endure whenever they need to deal with the local administration. Again, the liberal tendency within the document itself is hurriedly curtailed in the name of sovereignty (and thus, local context, a window of opportunity to conservative interpretation of international law) -Another peculiar article I noticed was the “Right To Live” (Art.20) and yet death penalty is not explicitly mentioned and abolished; alternatively, this could also be a constitutional roadblock against any pro-abortion legislation. In both cases, a well-meaning established principle is going to yield the opposite, reactionary outcome. The articles themselves operate pretty much under the same mechanism, especially on the executive branch: the King heads the newly-established Security Counsel (Art.54) still retains the General Staff (Art.53) religious leadership (the 1996 Article 19 turns into Article 41) and finally all cabinet meetings where the strategic decisions are made. The innovation in this constitution comes from the appointment of a Prime Minister from the majority party after a general election. The perverse established mechanism is too obvious: should a political party not amenable to the King’s views win a seizable majority of seats, the King, or his advisers, can weaken them by picking a Prime Minister other than the Party Leader. Divide and Rule, so that only obedient Prime Ministers can be appointed. Other than that, the King still retains power to hire and fire Ministers. Article 64 is a concrete threat to the Members of Parliament’s freedom of speech and immunity. The fact that the article enumerates these highly political cases instead of those potentially related to common law matters is not only a political threat to outspoken MPs, it is also an implicit invitation for the peoples’ representatives not to be bold, and whenever they can get away with it, engage in corruption and other improper behaviour from an elected office. All in all, the reports on newspapers that the King has curbed some of his powers is an attempt to polish a timid political process, or outright ignorance of Moroccan politics since 1956. While it is true the new articles spend a great deal of lengthy and tedious enumeration of dispositions, they do not bring new concepts other than those necessary for the decorum. Actually, if it was not for these accessories, the constitution just writes down the powers ” The King discovers while He practises them” as Professor Mennouni once said. This lengthy overview of the new constitution is two-fold: it explains why I stand by my decision to vote against the new constitution, and it describes quite eloquently the new regime we are living under. We have moved from the dictatorial Hassan-II era to that of Soft Authoritarianism. The red lines still exist, but there is no systematic repression on those who cross it. But to these impudent, contentious subjects, the retribution is random and sometimes harsh. In any case, both eras share the random-looking pattern of repression; But now that the Monarchy’s legitimacy is firmly and strongly entrenched, they can engage directly into formalizing their patronage over the other institutions. 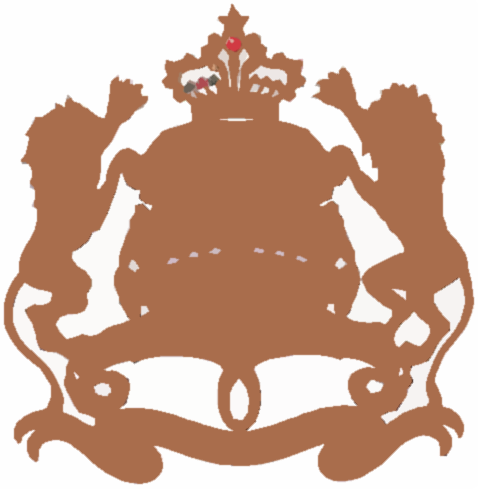 From a historical point of view, and bearing in mind the evolution of the balance of forces between the Palace and its real opposition, this new constitution does not take away powers from the King, it does not add up some more (if that was ever possible) it simply recognizes the Regal Hegemony. The second day had a lighter timetable, and changed focus from official policy to a more grass-root activism in new social media use for advocacy and causes. The morning event was hosted by the National Endowment for Democracy, based too in Washington, with some significant panellists and organizations, notably Robert Guerra from Freedom House. The conference main themes evolved around the tools developed and used by cyber-activists, with an emphasis on the Arab Spring, as well as internet safety for these activists, and -surprisingly enough- how private corporations can indeed participate in this process by committing to what Susan Morgan (Global Work Initiative, GNI) described as a kind of ethical policy in protecting freedom of speech and digital gathering. Of all four panellists, Meier’s contribution was interesting to listen to: his remarks focused on the live reports on the Internet during the Egyptian uprising, as well as the very promising Ushahidi project. He was quick to point out that the pure web-activism, in terms of time allocation and resources consumption, is comparatively less important (Meier gave a rule of thumb estimation of 10%) than the essential grass-roots work, to gather up testimonies, videos, pictures, and quite simply to report on the ground situation. Though it was an NED conference, there were some interesting people attending the meeting, and among those were internews, who basically design softwares and train bloggers and cyber-activists on how to bypass governmental censorship (firewalls and others) and basically work on the ways and means to insure freedom of speech. It was quite strange to notice that these people, even though they do receive some kind of public support, actually contribute more -in efficiency and resources- than the State Department. It might have to do with the fact that any support from an official body of the US government would be construed as foreign meddling in domestic affairs, and that the cause of Freedom of Speech, as the official goal of governmental policy, is best advanced with NGOs with seemingly no ties to any public American institution. So it was a bit peculiar for me to note that they are doing more on the ground by designing pieces of software and training cyber-activists how to use the internet safely, and by raising awareness among international -and in our case, American- public opinion. And quite frankly, my Bahraini fellow FPC blogger and journalist, Lamees, might actually benefit more from their support than that of the State Department’s. The second day following touch down at Minneapolis was lighter, and we had the opportunity to visit the University of Minnesota’s‘ campus, more specifically the School Of Journalism who accepted to host a morning meeting for all of us. 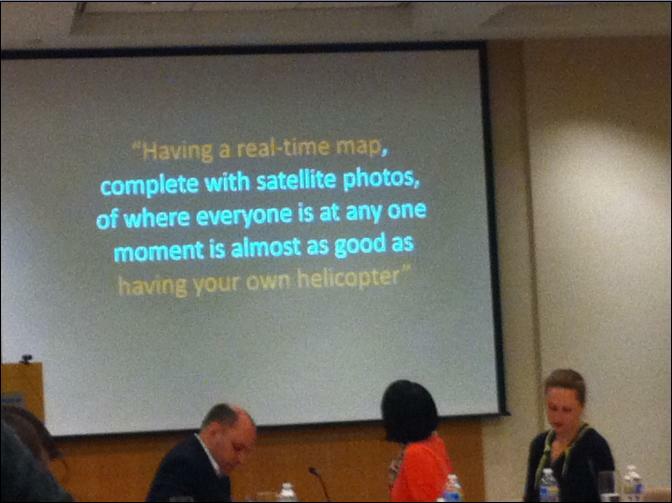 The talks evolved around the impact of use of the internet on reporting news. Now, because it is a school of journalism, and because the scholars and graduate students who attended the talks with us have a focus on Journalism, the various talks evolved around how journalists can use the social media to get the story out, especially in the case of the Tahrir Square rallies. There was also a discussion on the shortcomings of such tool, more specifically how to verify ‘the story’ and how journalists can make sure the local contacts are reporting genuine facts from the ground. Today is the second day with NetRoot Nation 2011 Conference. Follow the Hashtag #nn2011 on twitter to keep updated on what’s happening!